Can I just tell you have relieved I am not to have some Martha menu hanging over my head this weekend? I am very relieved. I haven’t found a cookbook to work my way through yet; I pick them up and feel too constrained, so for this week I made one of the recipes I have bookmarked in my Favorites folder. 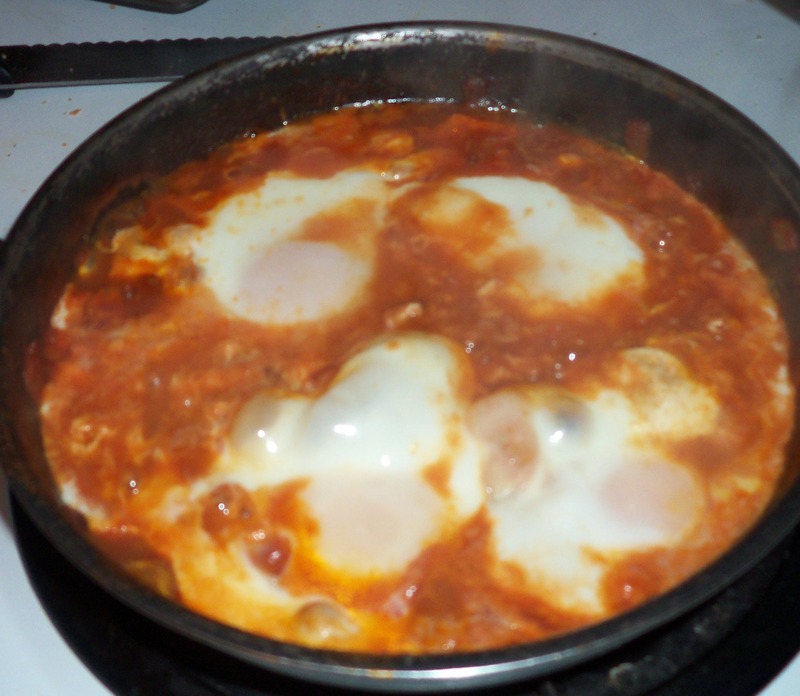 This is a Saveur recipe they call ‘Eggs Poached in Tomato Sauce” but I have it on good authority (according to the interwebz) that it’s a dish called Shakshuka, and is frequently eaten for breakfast in Israel. It was brought over by Jews from Libya. Whatever you call it, it sounded good and easy. To accompany it I decided to try making a Serbian flatbread called lepinja that we had last week at the new Balkan restaurant in town, named, cleverly, Balkan Restaurant. This bread was so far beyond an ordinary pita–it was light and fluffy and spongy in all the right places. I LOVED it. 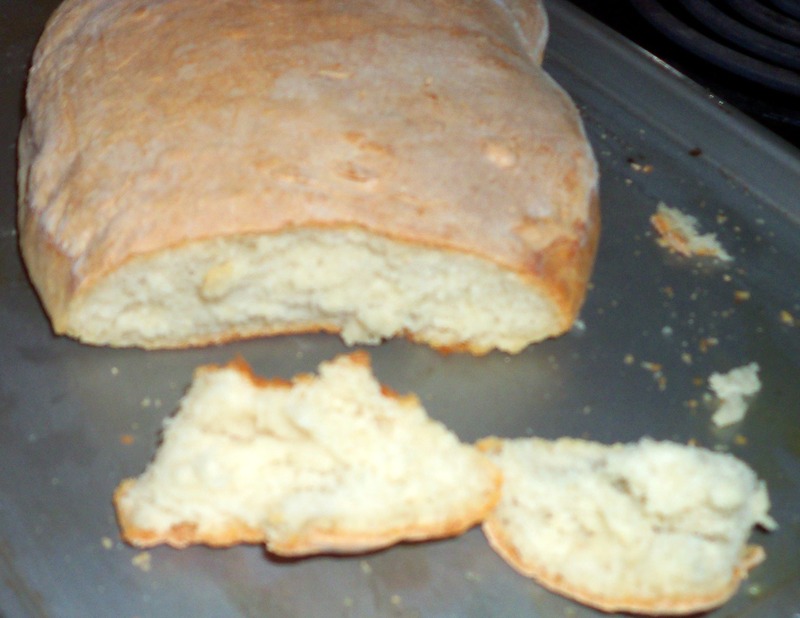 According to numerous forum postings there is no way to make good lepinja outside of Eastern Europe because the flour isn’t the same. I would not be deterred, however. I found a recipe on allrecipes.com, which doesn’t exactly have the best pedigree, but three people gave it 5 stars so I thought I’d give it a go. Well, of course, I immediately screwed it up, despite the simple directions: heat 2 T milk, sprinkle on yeast, mix with a cup of water and some sugar, then combine with flour and a bit of salt. I thought the dough seemed wetter than it should be, and then I realized that I had mixed two cups of water into the yeast. So, I fixed up some more yeast, added more flour and planned what to do with lepinja for 24. The dough rises three times, but the last two are just 30 minutes so it wasn’t too onerous of a process. The bread didn’t turn out as well as what we had at the restaurant, and there was no pocket inside, but it was still tasty bread. I certainly didn’t mind eating it! The shakshuka involves browning onion and jalapeno, then adding cumin, smoked paprika and garlic, followed by some whole tomatoes that you crush in your bare hands like a beast. The sauce cooks until slightly thickened, then the eggs are cracked on top to poach, covered. After the five-minute recipe-alloted time the whites were still clear, so I turned the heat up. That resulted in overcooked yolks, but it was fine. 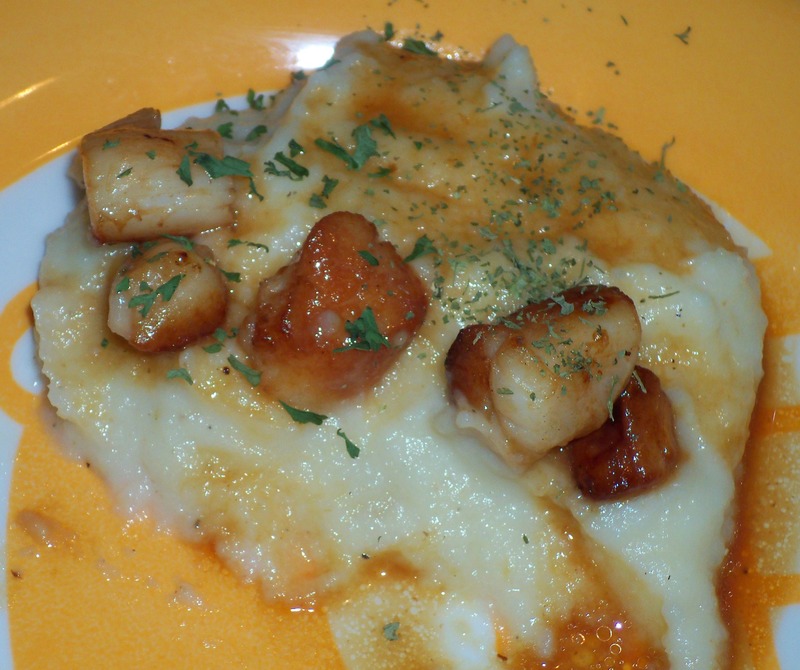 The dish is topped with chopped parsley and feta cheese before serving. I liked this dish well enough, and would be thrilled if this were a regular breakfast item in our culture. It’s much better than soggy French toast, for example. That said, I think the sauce could use more flavor. The jalapeno didn’t add much heat, so next time I would add more or try a different pepper. I will admit it isn’t much to look at. Well, Ms. Martha gets an A+ for using all seasonally appropriate ingredients this week! There is also nothing I don’t like, except for cilantro, so that earns her another point or two. My eagerness to try this soup was quickly diminished by the fact that I had bought the world’s hardest sugar pumpkin. It took me 10 minutes to even get the thing cut in half! I had sharpened my knives, and was terrified I would cut my finger off in the process. So, once I got it halved there was no way I was cutting it into cubes for roasting, per the instructions. I drizzled olive oil on the pumpkin halves and roasted them, along with a quartered onion, for 30 minutes. It was easy to scrape the pumpkin out after it baked. I forgot to roast the garlic clove, and I didn’t buy fresh shiitake mushroom caps, which were also to be roasted. I only needed two, and I find those bins of loose mushrooms very suspect. Who knows what kind of mushrooms those really are? The packaged shiitakes cost as much as a car, so I decided to use the dried ones we had left over from the mushroom broth recipe of a few weeks ago. I reconstituted them in the vegetable broth, and that was that. The pumpkin and onion were blended along with the mushrooms and the broth, and salt and pepper were added to taste. I added garlic powder when I realized that I had forgotten about the garlic. The soup was pretty bland; maybe the roasted mushrooms would have made a difference. The soup barely tasted like pumpkin; if we had closed our eyes while eating it I think we could have guessed it was some sort of squash soup based on its texture, not the flavor. At least it wasn’t sweet, though. Sweet soups are just wrong. I plan to add some chipotles to the leftovers to flavor it up. A can of black-eyed peas was mixed in with red onion, cilantro, Dijon mustard (of course), garlic, red wine vinegar, olive oil, salt and pepper. Right before serving it was added to a baby spinach salad blend. We both really liked the black-eyed pea mixture on its own and didn’t think the salad added much other than soaking up all the oil that was on the peas (and I had added less than recommended, which was three tablespoons!). The pea blend would be good added to a wild rice mixture, or maybe some kind of pasta for a pasta salad. The recipe can be found here. You might call them taquitos, but Martha calls these flautas. They involved making a cilantro/pepita/lime juice/garlic pesto, which was smeared onto a corn tortilla, along with some shredded Monterey Jack cheese. After rolling them up they are pan-fried in peanut oil. They were fine, if a bit oily, which is why I prefer enchiladas to fried tortilla-type-things. I had gotten some ‘artisanal’ corn tortillas at a fancy market and the flavor of the corn pretty much overwhelmed the mild cheese, so a blend with some cheddar would be better. The pesto was interesting. Martha said to toast the pepitas, which I didn’t think was necessary as they are already roasted. Mine were bordering on overcooked, so the flavor was a bit off. The recipe makes 8, but I halved it and made 4. We only had one each, so I tried one of the left overs for breakfast the next day. I popped it in the microwave and it was so nasty! All the oil came out. Blarg. It would be extremely hard to mess up a fruit crumble, but we can never underestimate Martha, so I was a tad worried since her baked goods have been hit or miss. This one involves apples and cranberries topped with a mixture of brown sugar, oats, chopped pecans and butter. It was not overly sweet and quite tasty! It took nearly two hours to make all of this, and half the pans and dishes in the house, so I’m not sure it was worth it. 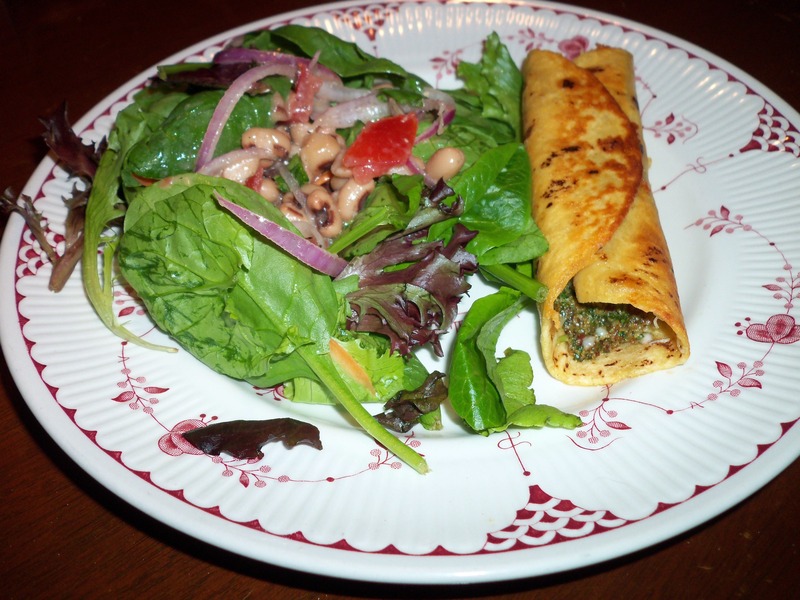 The black-eyed pea salad and the crumble were the stars of the show. We could have been perfectly happy to eat just those two. It was nice that this meal, aside from the fried flautas, was relatively light. All the flavors melded well together, which is unusual for a Martha Meal! This is the “Spring” meal I skipped back in March/ April because it was already 80 degrees. What with the baked apples and extensive oven time, it sounded more appropriate for a cool fall day, although I guess it was supposed to be for St. Patrick’s Day? Only Martha knows what is in her heart….. I have gone through most of the last 80 years thinking I didn’t care for scones. I tried them in coffee houses, where they were stale. I tried making them at home, and they came out of the oven tasting stale. But I loved the ones we had at the bed and breakfast last month so I was cautiously optimistic that maybe, just maybe, these would at least be edible. They were, in fact, quite edible! 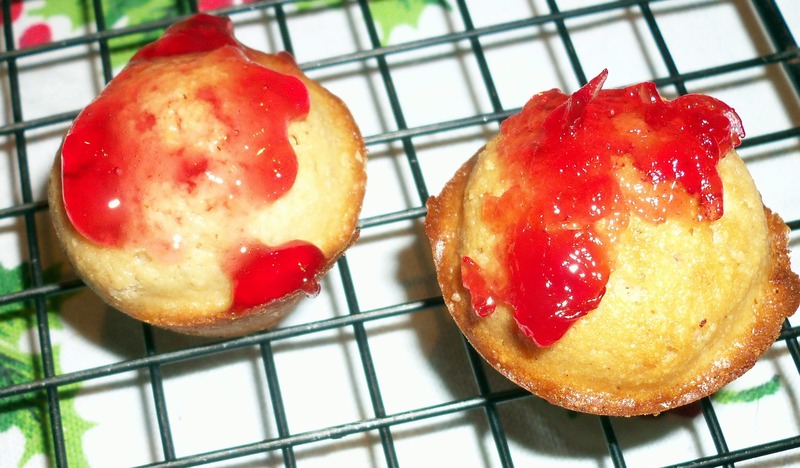 I made a half batch (4), lest they be hideous,but they were the perfect texture of dry/moist, and weren’t too sweet. I wasn’t sure about the currants as, after all, aren’t they just dwarf raisins? But they were fine. In fact, I think this is an excellent base recipe, and plan to make another batch using some dried cherries we have in the pantry. Oh, did I mention that I made these in the morning, and we ate them for breakfast/brunch, warm from the oven? We tried them again later, with the meat per Martha’s recipe, and it was quite an odd choice to serve with beef and cabbage and horseradish. No, no, no. Eat these little lovelies on their own and let them shine. Preheat oven to 425 degrees. Whisk together flour, sugar, baking powder, and salt in a large bowl. Stir in currants. Add cream, and stir just until combined. Dough should be sticky. Turn dough out onto a lightly floured work surface. Gently gather dough into a mound just until it holds together. Pat into an 8″ circle about 1/2″ thick. Cut into 8 equal wedges with a bench scraper. Arrange wedges on a baking sheet lined with parchment paper. Brush tops with melted butter. Bake until golden brown, about 20 minutes, rotating pan halfway through. Transfer scones to a wire rack, and let cool slightly. Serve warm or at room temperature . *The recipe calls for 1/4 c wheat germ, which I didn’t use. I also forgot to brush them with butter until they were halfway done cooking. Well, it’s a bit of a long story, but my farm share co-op substituted an eye of round roast for the bottom round I had ordered. I wasn’t sure if I could still cook it the way the recipe suggests: browned, then roasted at 350 for a an hour or so with some onions. So, I perused the wisdom of the internetz and found this recipe, which also got rave reviews on the Chowhound boards. I rubbed the roast with olive oil, kosher salt, pepper, and garlic powder, then placed it in the 500 degree oven, immediately turning it down to 475. After 12.5 minutes (7 min/lb), I turned the oven off, set an alarm on my phone for 2.5 hours later and hoped for the best. Curiosity got the better of me at hour two, so I checked the temperature, even though the recipe forbids opening the oven prematurely. The temperature seemed low, so I turned the oven up to 225 for the last 30 minutes. At that point, the meat thermometer still wasn’t registering 140 degrees (for medium rare), so I turned it up to 350 and left it in for about 10-15 minutes, as we prefer our meat medium. (Well, The Husband prefers his burnt to a crisp, but he can always put his piece in the microwave or oven). The meat turned out perfectly! It was still pink in the middle and nice and tender. We liked the crust it got on the edge. Martha suggested serving the meat with a sour cream/horseradish/lemon juice sauce, which I didn’t care for (STOP PUTTING SAUCES ON BEEF UNLESS IT IS AN AU JUS!) and The Husband thought straight horseradish was better. The grocery store I shopped for this meal didn’t have leeks and I wasn’t in the mood to go anywhere else, so we did without, just like in the Great Leek Famine of 1907. I was supposed to simmer cabbage wedges and a leek in chicken broth with peppercorns and a bay leaf. I added a potato, because everyone knows that beef needs potato, plus this is supposedly an Irish dish (I guess?) so why not? The cabbage and potatoes were ok–nothing to write home or a blog about. I would have preferred some kind of good potato dish with the roast. Ah, well. 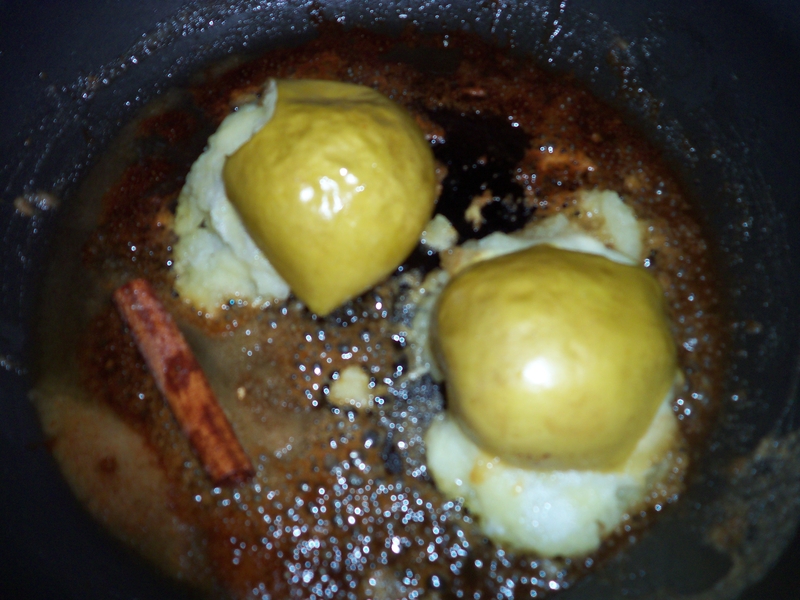 I have never made baked apples before, as I am not a fan of hot fruit. But they have a special place in my heart because on our first date at the Coventry Arabica, The Pre-Husband had to leave after a couple of hours because he had left some apples baking in his oven. How cute is that? (I was worried that he would burn his apartment down, but evidently they turned out fine). These did not turn out fine. At all! And now my baked apple fondnesses are RUINED!!! First I melted butter in a skillet, then mixed in some sugar, ground cinnamon, and added the apples cut side down and a cinnamon stick. They were to bake a mere 12 minutes. At that point, two were tender and two needed more time. I put the non-tender two in for another four minutes. When I went back, the apples had exploded out from under the skin. The ones that didn’t explode were ok, but the skins were still tough, and the “butter sauce” was really closer to a taffy consistency. The ones that exploded had browned on their exposed edges, and had an oily taste. Boo! What an odd meal–it was as incomprehensible as a James Joyce novel. 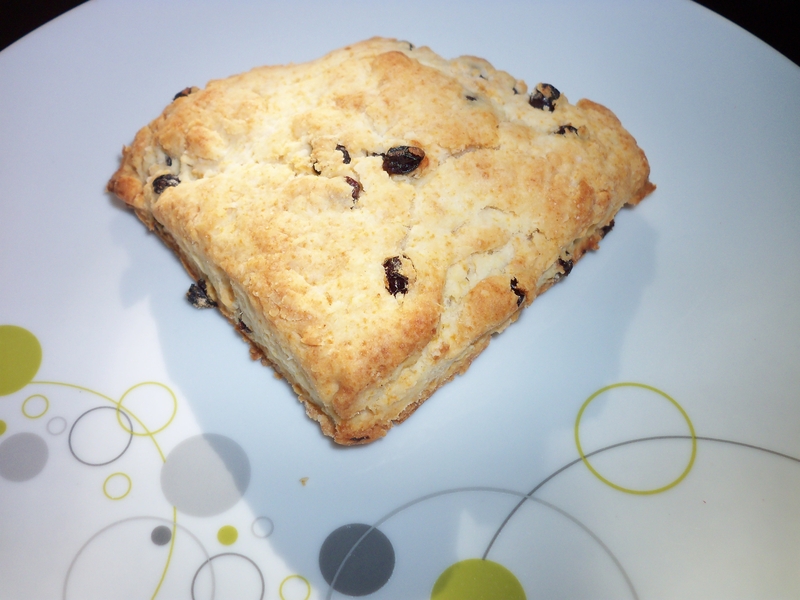 Scones: A At last, a good baked dessert. This week’s meal involved making a full dinner with a baked dessert in under an hour. But was it good? Meal No. 42: Skillet Rib-Eye Steaks; Broiled Peppers with Melted Cheese; Broccoli with Garlic and Anchovies; Molten Chocolate-Espresso Cakes. Recipes, from Martha Stewart’s Dinner at Home, can be found online here, but the dessert is called Chocolate Truffle Cakes, and is a bit different. Hmm. The recipe called for rib-eye, which I couldn’t find, so I got a T-bone. Or maybe it was a Porterhouse. I don’t know–it was nearly a pound and had a bone in it. The steak was salted, peppered, and pressed gently with rosemary. Olive oil was heated in a cast iron skillet with a couple of cloves of garlic, then the steak was tossed in to sear. It only seared in one spot, so I guess my steak wasn’t cut evenly, or my burner is crap, or probably both. Once the steak was done, it was removed, and more rosemary was tossed into the pan of oil until it sizzled, then the oil/herb mixture was poured over the steak. The rosemary lent a nice flavor, but the oil was too much for me. Ew. Oddly enough, the store didn’t have asiago cheese (although there were plenty of more exotic choices) so once I broiled the Anaheim chiles for five minutes I stuffed half with a string cheese stick and half with a Mexican cheese blend we happened to have in the house, and popped them back in the oven until the cheese browned. These were ok–The Husband found the texture of the string cheese suspect, as I knew he would. The Mexican cheese melted nicely, but it needed something else to make it really tasty. I suppose I could have used a hotter pepper, but the Anaheim was one of the types she suggested. Broccoli was sautéed with garlic and chopped anchovies in olive oil. It seemed a touch oily, and although the dish seemed seasoned, it wasn’t apparent that it was anchovies doing the work. I suppose that could be a good thing or a bad thing, depending on how you feel about anchovies. At last! A “real” dessert! Too bad I couldn’t eat it, due to its chocolate content. These were very quick to mix up. I made a half batch, which made three little cakes. At first the insides were appropriately gooey, then, just as Martha foretold, they were fudgey on the inside after cooling to room temperature. The Royal Taster/Husband says they were good, but he thought they were too alkaline in taste, due to the bittersweet chocolate and espresso powder. He thinks he would have liked them better if made with some semi-sweet chocolate instead. Note that this didn’t stop him from eating all three in one day. The recipe in the above link is different, as it doesn’t have vanilla and involves more chocolate and fewer eggs. She says to make that one a day ahead for extra fudginess. I wonder why she changed the recipe for the menu? There’s a similar molten lava cake recipe on the site that doesn’t contain espresso. Ah, well. I was quite pleased that the entire meal only took 50 minutes to make. It was all edible, so I will chalk this up as a win, although I don’t think I would make any of these recipes again without tweaking them. I also thought it seemed a bit heavy, what with the steak, oil on the steak, cheese, oil on the broccoli, and cake. The Husband was wondering where the carbs to absorb the fat were. Also, the photos were all very unappealing, so I didn’t add them. Steak: B I think this would have been better cooked on the grill, and without the oil poured on top. This week’s meal was full of fiddly-ness. It turned out pretty well, considering a major component was somewhat disastrous. Meal No. 33: Grilled Striped Bass; Corn and Clam Chowder Sauce; Oyster Biscuits; Watermelon and Raspberry Salad from Martha Stewart’s Dinner at Home. Menu and recipes available online here. 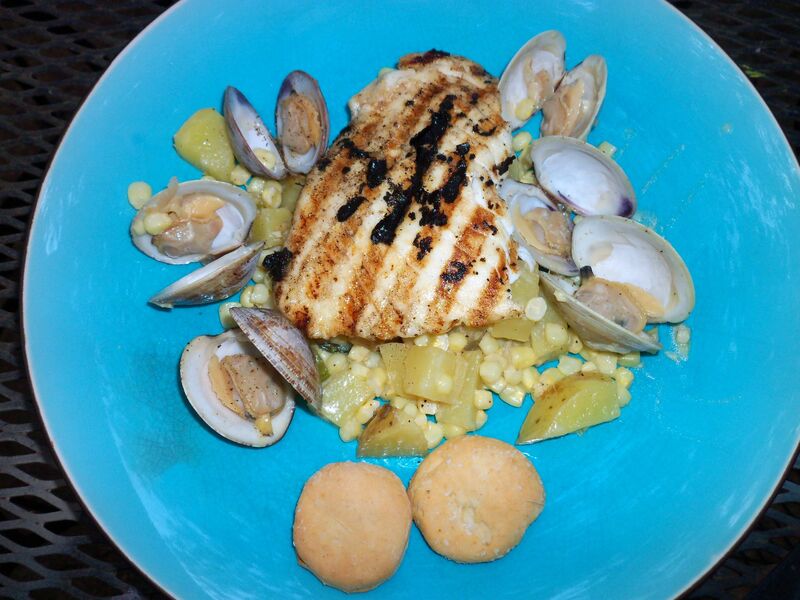 Martha says you can substitute a firm white fish such as halibut or red snapper for the bass. Since I just so happen to have some halibut steaks that my friend Caitlin caught with her very own hands in Alaska, I opted to use these. Of course, I was really hoping that the recipe wouldn’t ruin them, since they are very precious! The fish marinated in olive oil, lemon juice, lemon thyme and garlic for 30 minutes, then was grilled. I thought it was delicious–very lemony. The Husband didn’t think it had much flavor on its own, but enjoyed it with the sauce, below. Back in winter I made Martha’s spaghetti and clams recipe, and there was all that concern about whether I had killed the clams prematurely by keeping them in a paper bag overnight in the frig. It turned out they were fine, so I did the same thing this time, except when I pulled the bag out of the frig the bottom broke, due to extreme sogginess, and half the clams spilled onto the floor. The Husband worried that they might bite him, but some were already dead and opened, so we had to throw a third of them away. The rest were cleaned and soaked for 30 minutes. After the clams cooked in some wine, they were removed, and shallots, a potato, celery, corn, the strained clam juice, thyme, a bay leaf and some cream were simmered until the potatoes were tender. In the intro to the recipe, Martha writes that this is brothier than a clam chowder, but that was not my experience; it wasn’t even close to being brothy. It actually was closer in consistency to the creamed corn we made a few weeks ago. Creamed corn with clam juice, and potatoes and celery. The clams were beyond unfortunate, as they were overcooked and rubbery; basically inedible. I made a half batch, but that was still $10 worth of clams ruined! The Husband, who didn’t care for the recent creamed corn dish, really liked this one. I thought it was pretty good–I am a fan of anything that involves a potato or corn, so it was fine by me. I thought it was a bit bland on its own but it went well with the lemon flavor of the fish. Even if they hadn’t been cooked to rubber, we found the clams superfluous to the dish. We had a nice piece of fish, why did we need clams? The same thing could be accomplished by using a bottled clam juice, and using mushrooms for an earthy taste. In fact, I should try that and put it in a cookbook. Where can I buy some minions to do it for me? I was excited to try these, which are supposed to be a cross between an oyster cracker and a biscuit. 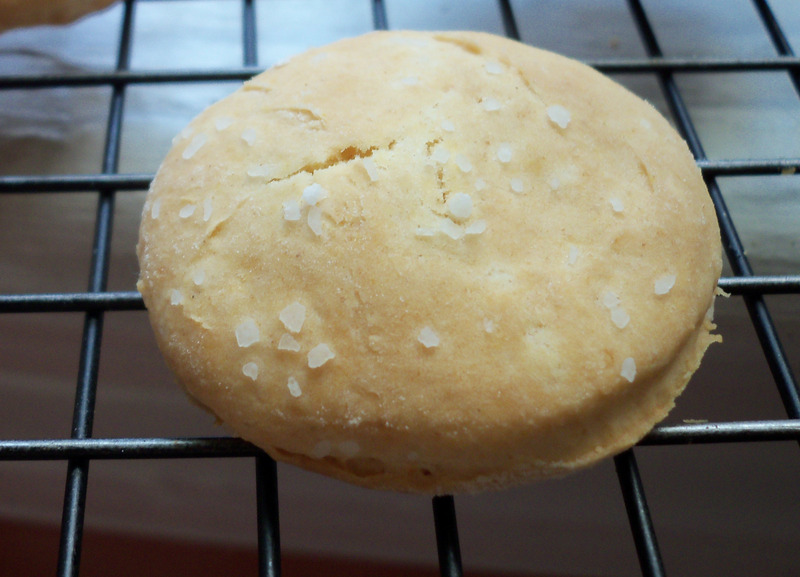 I made these early in the morning, and they were pretty cracker-like fresh from the oven. They were a touch salty, but otherwise tasty. I used the variation with cumin in it, and I think next time I would use more cayenne. By the time we ate dinner, however, the texture was more like a biscuit that had been sitting around all day, which is a texture I don’t particularly enjoy. Martha writes in the recipe that these can be made up to a week in advance, though, so I’m curious to see what happens to the leftovers in a few days. I thought they were kind of redundantly starchy with the corn and potatoes, but The Husband, who doesn’t even like biscuits in real life, actually enjoyed them with the dish. Go figure! The recipe calls for a 4.5 lb watermelon. I had a watermelon, but there was no way I was weighing it. I cut off a hunk that looked like the appropriate amount for a pint of raspberries, and cubed it. The fruit was tossed with the juice of a lemon and a quarter cup sugar, and macerated for 30 minutes. I didn’t know what to expect–lemon and watermelon? Why is the salad all red? But, it was actually good. Martha suggests an option to eat it with vanilla ice cream, but the watermelon was too watery and it was just bizarre, so we nixed that after a bite. I am surprised she didn’t throw in mint, though. The Husband wondered where the booze was. 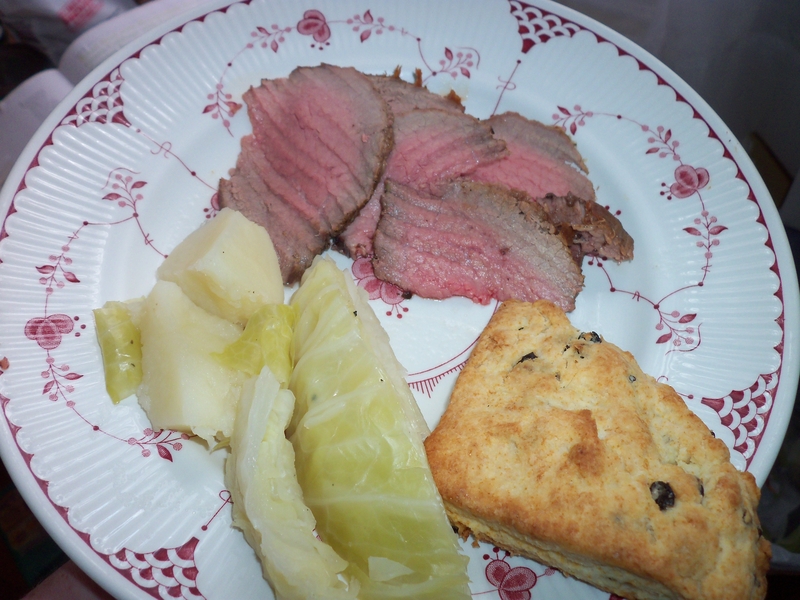 The meal was fiddlesome– every component except the biscuits had something that needed to soak, marinate or macerate for 30 minutes, so it made the timing tricky There was also a lot of chopping and prep work. I am glad I didn’t try to cook this on a weeknight–the dinner portion took 90 min, and the biscuits took about 40 minutes earlier in the day.If you make this, we recommend having a white Cote du Rhone with it. Mmm. mmm. good.